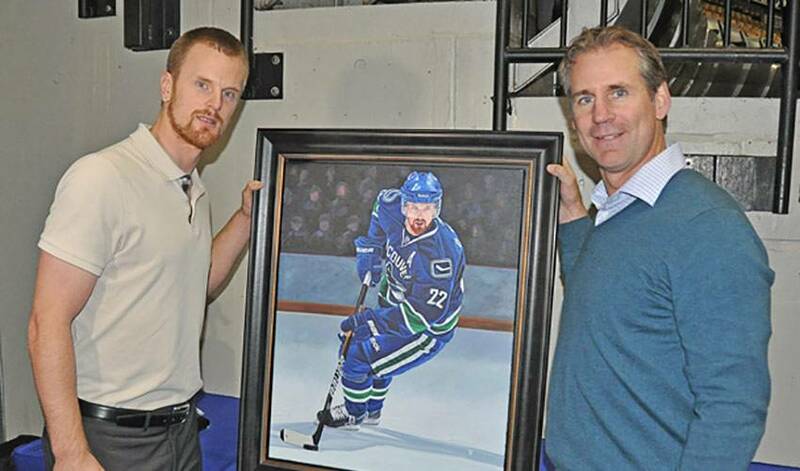 With the holiday season upon us, the staff of the NHLPA, artist Tony Harris and a few of the Vancouver Canucks gave Daniel Sedin a surprise gift on Friday that he will no doubt cherish for many years to come. Early Friday afternoon, at the Air Canada Centre in Toronto, Sedin received a personalized miniature replica of the Ted Lindsay Award, as well as a unique and one-of-a-kind painting from Ottawa-based artist, Tony Harris, who the NHLPA has commissioned to do portraits of each of the recipients of the Most Outstanding Player Award. After arriving from the airport at the Air Canada Centre, Daniel was told by a handful of his Canuck teammates that he was going to meet some fans and take some photos. With a group of his teammates on hand, including Roberto Luongo and Alex Burrows, Daniel was pleasantly surprised to find that he was receiving these unique gifts when he entered the ice-level corridor of the ACC. After some brief remarks from NHLPA Director of Communications, Jonathan Weatherdon, Daniel was presented with both the personalized Ted Lindsay Award trophy and the painting. He was then introduced to Tony Harris, and had a unique opportunity to speak to the artist himself about the painting and all the small and unique elements contained within it. Daniel now has two new additions to his career memorabilia, both items that he will undoubtedly display proudly in his home. Daniel Sedin and Alex Burrows surprise youth hockey players at local arena. In recognition of his stellar career and his achievement of 1,000 games played in the NHL, Daniel Sedin is the NHLPA.com Kraft Player of the Week.